We live in a time of increasing volatility. Disruptions of all kinds – from the economic to the ecological, from the social to the geopolitical – arrive with little warning, from surprising directions, and leave serious consequences in their wake. 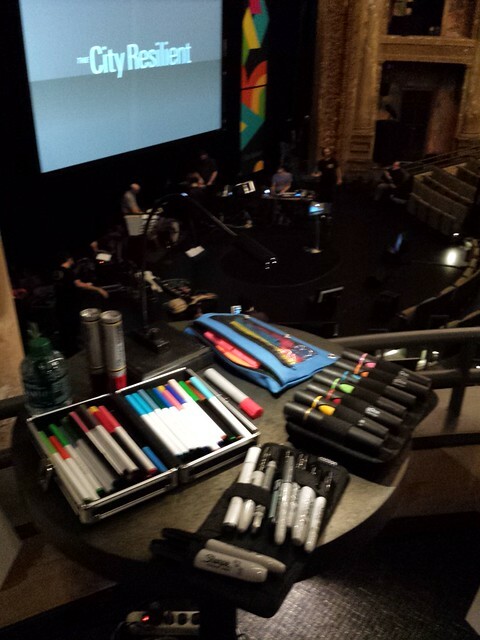 Hundreds of participants gathered at the Brooklyn Academy of Music's Harvey Theater on June 24 for PopTech's 'The City Resilient,' a day-long exploration of the diffuse and increasing threats to cities and communities around the world. 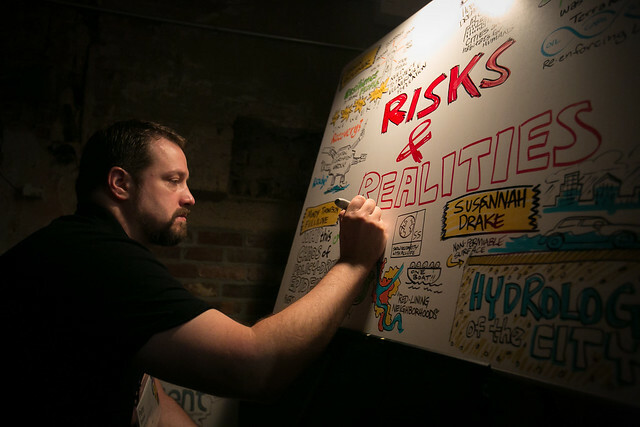 Alphachimp's Peter Durand was onsite to capture a full day of presentations and Q&As that tugged at strands in the tangle of strategies designed to make cities more resilient. This topic of "resilient cities" raises a host of important questions: How do we empower communities to improve their self-reliance and act effectively on their own behalf? How do we build new social networks and social capital that cuts across socioeconomic lines? 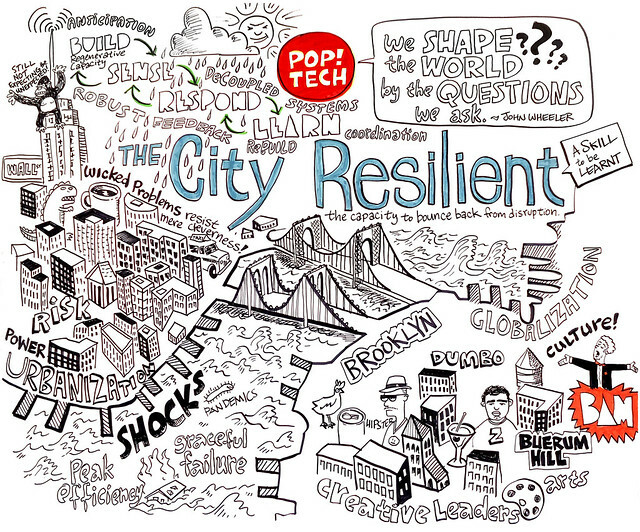 How do we physically build more resilient urban places and more resilient infrastructure? How do we use distributed technologies and ‘big data’ to sense and respond to emerging risks? How can new tools and platforms allow for rapid, creative responses to urban disruption? What are the roles of culture, of the arts and humanities? What is the role of leaders, of all types – governmental, corporate, social sector, citizen/volunteer – in bolstering resilience? Emerging mega-cities will face greater risks from global challenges like climate change. And disruptions will metastasize, as cities become more interwoven as a result of globalization. 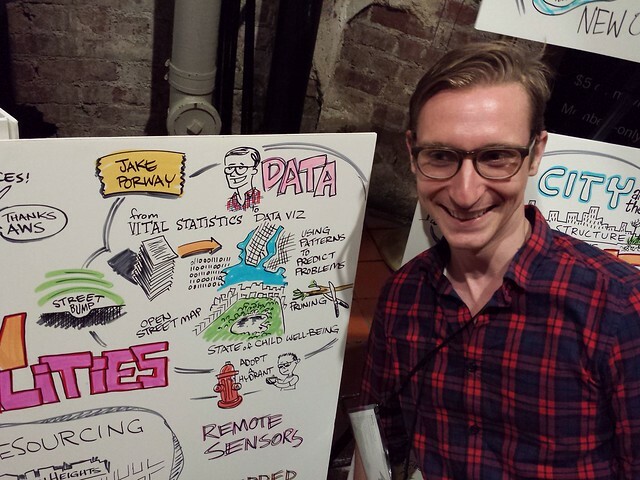 Jake Porway launched DataKind to match nonprofits with pro bono data scientists to solve problems using data collection, management, and analysis in the service of humanity. Porway launched DataKind (formerly Data Without Borders) to match social change organizations with pro bono data scientists to solve problems using data collection, management, and analysis in the service of humanity. Graphic facilitator and New Yorker contributing cartoonist Drew Dernavitch joined the event for the design charrette on Day 2, facilitated by Frog Design and The Pomegranate Center. This daylong design charrette and intense brainstorming was made possible by The Rockefeller Foundation. 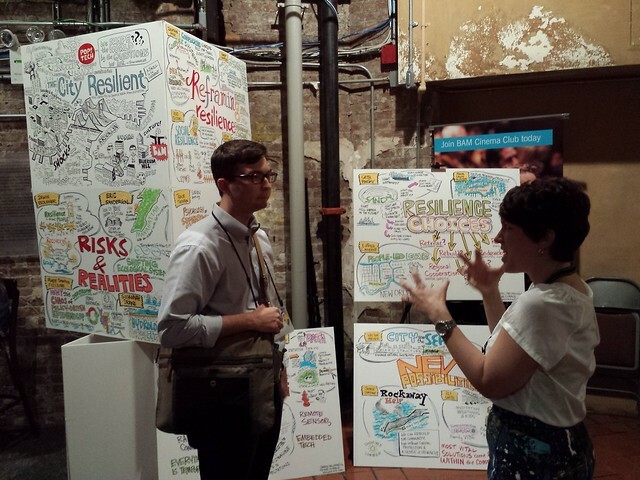 Around 100 technologists, community activists, landscape architects and other experts participated in the workshop, which included small group discussions and exercises designed to spark creative thinking around the concept of urban resilience. The day started with a brainstorming session managed by the Pomegranate Center's Milenko Matanovic. 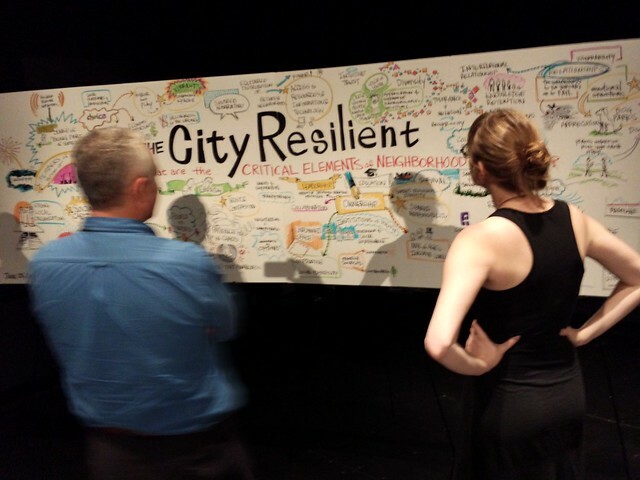 Matanovic posed a question: "What do you think are critical elements of neighborhood resilience?" Participants responded by developing a list of 66 elements. Examples from that list: social capital; volunteerism; ownership; knowledge retention across generations; communication within and between neighborhoods; access to resources; humor and play; trust action and compassion; diversity; and, people who act as nodes. The event also included breakout sessions managed by frog in which groups of 6 to 8 participants worked for hours to develop new ideas for how a hypothetical city could respond to a disaster. In one exercise, for example, the made-up coastal town of Faraway Beach, population 100,000, is struck by killer storm Hurricane Hartmut. The scenarios were further complicated by the addition of "slow" disruptors, like economic collapse. Identify the elements required to make a community resilience before disaster hits. 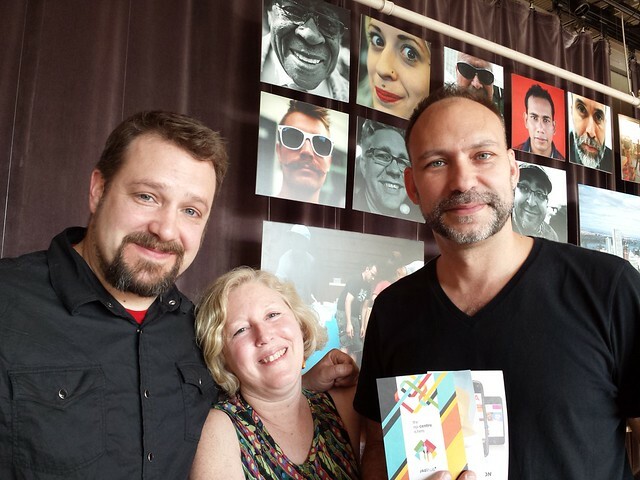 Peter Durand of Alphachimp Learning Systems LLC; Leetha Felderman, president of PopTech; and Gustav Praekelt,managing director of Praekelt Digital and the Praekelt Foundation, who is proud to announce the launch of JoziHub, a co-creation space in Johannesburg dedicated to creating sustainable change in Africa.